In the United States, Memorial Day is Monday, May 25. Established after the Civil War by Union veterans, the first Memorial Day (originally called Decoration Day) was celebrated in 1868. In 1971, the day became an official U.S. holiday and is now celebrated on the last Monday in May. You may know that Memorial Day commemorates the men and women who died while serving in the military. But, did you know that Congress passed an act in 2010 that encourages everyone to stop at 3 p.m. on Memorial Day for a moment of silence? During this time, Americans are urged to observe a moment of remembrance for all who lost their lives in wars throughout the years. Huffington Post reported in 2013 that there have been a total of 1.19 million war casualties. This equates to an average of 28 burials each weekday at Arlington National Cemetery in Washington, D.C. The 3rdS. Army Infantry Regiment has placed flags on Arlington graves since 1948, and 220,000 flags were placed for Memorial Day in 2012. The song “Taps,” the 24-note bugle call played at military funerals, was originally used as a signal to notify soldiers to cease their evening activities and return to their garrisons. Many people wear poppies to honor America’s fallen soldiers on Memorial Day. The practice of wearing poppies originates from a poem written by World War I Colonel John McCrae titled “In Flanders Fields.” The poem had a huge impact on two women who worked to initiate the sale of artificial poppies to help those left orphaned or alone after the war. On Memorial Day, it is customary to fly the American flag at half-mast until Noon before raising it to the top of the staff until sunset. 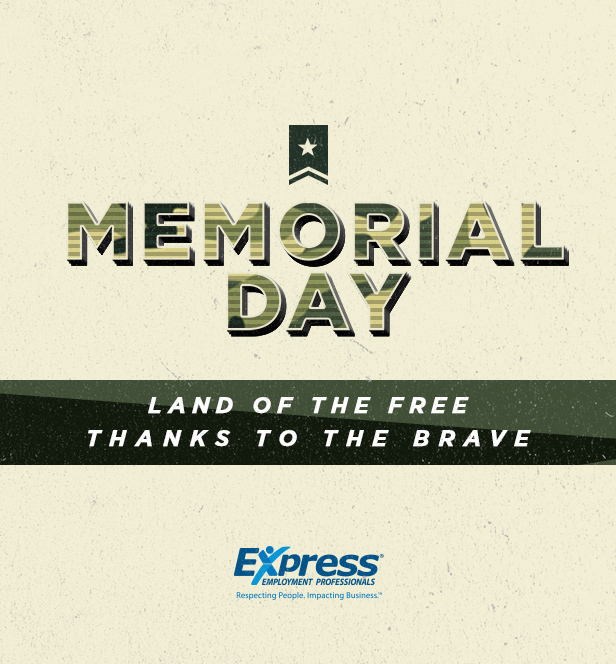 On this day of remembrance, Express reminds everyone to take time to honor our fallen soldiers and loved ones. We wish you a happy Memorial Day!